I had just come face to face with immigrant philosophy. And it was about to remind me why we need to have our assumptions challenged. My student has a large Vietnamese family who lives all over this country. He does not come from a wealthy family in Vietnam. Most of his extended family are farmers or traders. But after the Vietnamese war, many relatives immigrated to the US and have set up their families here. And they set up their own businesses–nail salons are a favorite. So are restaurants. My student, diligently learning English. My student told me that his aunt in California made $20,000 per month at one restaurant, and her family owned four. He’d also been educated about taxes, too. One nail salon owner paid $50,000 in taxes a year (we talked about retirement accounts, then, and how they can help you pay less in taxes). “But I want to be an electrician,” he told me. “My dad’s friend works two weeks then stays home two weeks. He makes $15,000 a month.” We talked about going to technical school to become an electrician, how long that would take, and how much it would probably cost. It would cost a lot less than what I expect college to cost for my kids. My student told me when he turns sixteen, he’s going for three licenses: driver’s license, hair, and nail license. That way, he can work at the nail salon for his tech school tuition. But here’s the big question I had after our conversation: was my student right? Are these salaries accurate? Does it make more sense to go to tech school and skip an expensive 4-year degree for a first-generation immigrant? As we talked, I thought back to a class I audited back in 2002, at the university where I worked in Chile, taught by a Harvard-educated professor who was visiting from the US. He was teaching a business case about opening dry cleaning shops. We reviewed the financials, and saw that, because of a lack of new technology and high overhead, dry cleaners were not a good investment. They couldn’t really make a profit if they paid employees the going wage. Unless… “unless you’re a family where everyone in the family works at the shop,” he told us. “Parents, sisters, brothers, aunts, uncles. Then everyone works without pay and you share the total profit. Most shops earn around $100,000 a year, so that would be more than enough for a family to live on.” This is why dry cleaners are a popular choice with immigrant families, because with everyone pitching in and helping with the family business, the family can enjoy a six-figure income. So, do nail salon owners really make $30,000 per month? At first, I thought it highly unlikely: The Bureau of Labor Statistics cites the average income for an owner of a nail salon as $40,580 a year. However, that’s only reported income (paid via credit card-cash earnings could potentially be unreported). There is overhead to think of, like in the real estate business, which is high, and workers are usually paid via a compensation model: that is, they receive a percentage of all the services they provide. They are rewarded for being fast and efficient. After talking with many more individuals, I realized that not only could they make $30,000 a month, many make more. The nail salon where my student’s mom works is the only one in town and is constantly packed. His uncles are currently opening a nail salon in a neighboring town, so the figures he’s discussing are probably accurate. 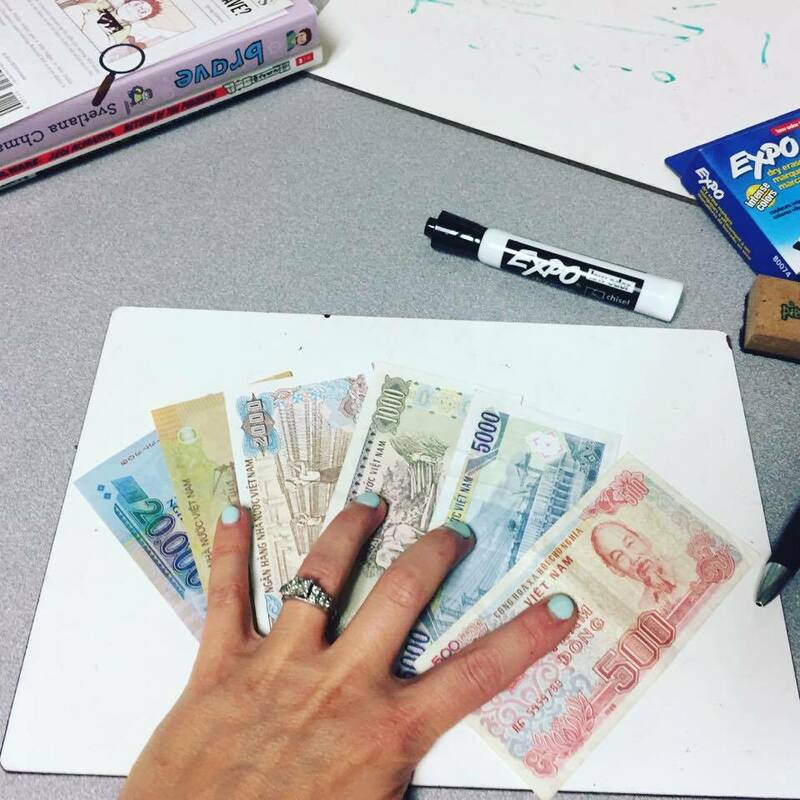 My nails, blue from a recent visit to my student’s mom (showing off Vietnamese money). Manicurists and pedicurists report earnings of an average of $22,150 (as of 2016) per year–that’s about $425 per week on average, around the country. In the top paying region of the country, Springfield, Illinois, manicurists earn $46,850 a year. An article by the LA Times reports that manicurists in a Vietnamese-American salon there earn $100-$200 per day. But because many workers underreport their wages in order to avoid paying taxes on them, it’s hard to get an accurate figure. It’s also hard work: my student tells me that his mom works long (11 hour or more) days, often without breaks to eat, and her time is spent bent over her clients, which is hard on her physically. One of the reasons work in a nail salon is so appealing is low barriers to entry: you must be licensed to give manicures and pedicures, but you can do this by taking a short class. You don’t have to speak English very well (or at all, if there are other English-speakers in the shop). For salon owners, you need starting capital–perhaps $40,000-$60,000–enough to rent and renovate your shop and buy spa chairs, polish, and mirrors. If you’re able to keep your overhead low, you can earn more. Savvy immigrants probably find many ways to keep costs low and profits high–after all, these are people who were audacious enough to leave their home countries and move somewhere new to set up a new life. That takes a certain chutzpa. Also, in our part of the country, New England, nail salons charge more than they do in large cities like Atlanta. There is less competition (but less demand, too, especially in winter). And why are so many Vietnamese immigrants nail techs, anyway? I came upon this intriguing story that explained more: Tippi Hedren, an actress famous in the 1960s for roles in movies such as Alfred Hitchcock’s The Birds, visited a Vietnamese refugee camp in California with the idea of helping women find a trade in their adopted country. They loved her manicure, and she realized that would be a wonderful profession. She brought in several manicurists to train the first group of women, and shortly after, Vietnamese refugees began opening discount nail salons all over Southern California. Today, Vietnamese-American salons charge anywhere from 30-50% less than luxury salons, according to the article. And many–most–nail technicians are sending money home to their families in Vietnam. A whopping 8% of GDP in Vietnam is due to money sent home from Vietnamese living and working abroad. So does it make more sense for my student to work in a nail salon or go to college? While becoming a nail tech could probably provide a comfortable living, it’s hard, physical work and he could probably make more with less effort elsewhere. 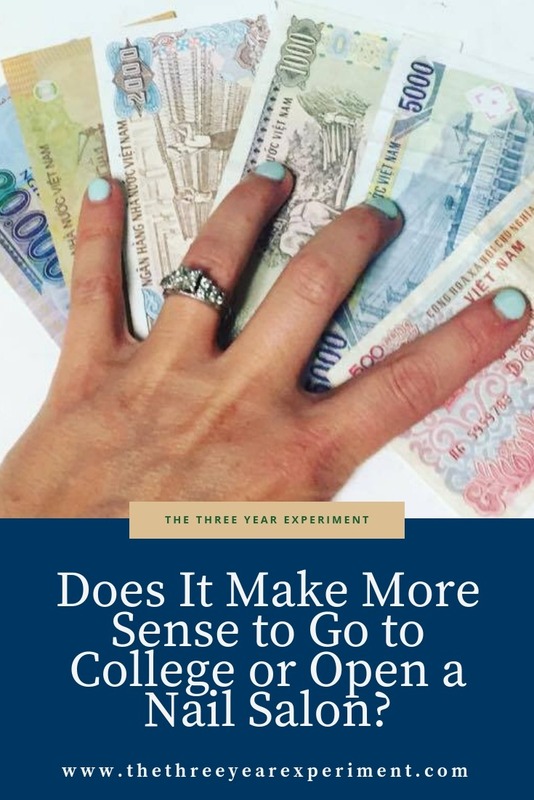 But college, even a community college, is probably not a good idea, in my opinion, because of several reasons: 1. the prohibitive cost, and 2. the delayed nature of earning money. My student will undoubtedly be expected to start working and help his family earn money soon after he graduates. Before I gave up my advice on higher education for my student, I wanted to investigate his idea about becoming an electrician. The Bureau of Labor Statistics says electricians earn $52,720 per year. However, in Boston, electricians earn an average of $71,120. In a rural area like ours, where service professionals are in high demand, it’s possible (in fact, probable) that they could earn more. Normally, electricians receive training, through a technical program or apprenticeship, and then become licensed (and in some states, certified) to work. Apprenticeships generally last 4-5 years. Apprentices need to be 18. After learning more about both nail salons and electricians, I think becoming an electrician is an excellent career option for my student. “Blue-collar” trades like this and plumbing, welding, and bricklaying are professions that pay very high wages, and allow students to go through an apprenticeship or complete a two-year technical program for far less money (around $9,000 per year). Trent from The Simple Dollar wrote a great article about the benefits of trade school, especially for those who aren’t great students (or who, like my student, don’t speak fluent English yet). My student won’t need to study for four years, will probably be able to pay his way through the program, and can expect a higher-than-average salary during his working life. To me, that’s a win-win-win. Of course, if my student could become an entrepreneur like his uncles or aunt in California, then he’s essentially in charge of writing his own check. So the real lesson to me was, how can I encourage my other students to feel confident enough to take risks and start their own businesses? Once again, my students help me shift my focus and see the world through a different set of lenses–in this case, not rose-colored, expensive, ivy-league-bound lenses, but practical, real-world specs where earning a living now and making more money later have to intersect. What do you think about college and careers? Do you see the value in a pricey four-year school? Would you consider the tech school route for your kids or family members? Or do you think entrepreneurship is the way to go? I actually think colleges should mix both technical and philosophical. There are 4 years, if there’s room for a major and minor then remove the minor and replace it with a technical skill. Nail salons do make good money and they’re incredibly stealthy. My mom, who was an education professor for years, feels the same. There are major benefits to technical professions that I think have been forgotten with our obsession on liberal arts degrees. In South America, almost all degrees are technical tracks, with practical skills thrown in (if you study Spanish literature, for example, there are teaching classes, etc., for you to learn how to become a professor). Great story, Laurie. Kudos to your student. We always planned for our kids to go to college. I’m glad they did and we paid for it all too. They were both cut out for it and are now doing well in their chosen careers, so I do think the cost was worth it. However, I think trade schools are a great alternative for many. If either of my children would have wanted to go that route I would like to think I’d have been open to it. I’ve never been able to bring myself to pay for a manicure or pedicure. Funny what each of us will and won’t spend money on. Thanks Amy! Yes, my student is pretty cool! 🙂 We’ve always planned for our guys to go to college as well. They got our intellectual genes and will do well in a higher education setting. We’re also able to pay for the majority of the cost for them, so they won’t be saddled with debt after graduating. Ha! I tend to buy myself one pedicure a year–on my birthday (my sister and I treat each other and go together if we can). This year, I bought an extra manicure just so I could meet my student’s mom. I agree that I find it wasteful, but I love my toes so much after they’re done! I’m glad you really dug into the meat of this with your student. It will be interesting to see where he ultimately ends up. And yes – tech schools can be absolutely great (where my husband went). I really learned a lot from him in this conversation. I’ve been really impressed with the education tech schools offer as I’ve learned more. What does your husband do? My name is Gary. My (vietnamese) wife and I have been married for 15 years and own nail salons. Your article is spot on until you get to questioning your students claim that the shop owner was making $30,000 per month. That is quite accurate. The flaw in your article is that you pulled numbers from a government agency/IRS. The numbers that the IRS has are what shows up on a tax return for both salon owners and nail techs. Salon owners and techs always encourage cash transactions to keep as much income hidden from the government as possible. If you were to go strictly by the reported earnings from tax filings, no one would want to own a salon nor be a manicurist. Again, the nubmers your student reported are accurate. The owners have to pay the taxes on their income and therefore they (we) try to do all we can to report as little income as possible. Most nail techs are paid commisions and therefore also responsible for paying their own income taxes…wich again, they report as little as possible. For a nail tech, the difference between showing 28,000 in and 50,000 is thousands of dollars in taxes. In fact, the only exception to this is when a tech is ready to buy a house or get a business loan, then they will suddenly make 3 times as much as they did the year before….so that their income looks good to the bank. This is great information. It explains so much. I wondered how my student could be so sure of the numbers, and then have such vastly different ones pop up. When I was a waitress, servers used to do the same thing with cash tip money. While I can’t say I condone the idea of underreporting your taxes, I certainly understand why people do it. Best of luck to you and your wife, although it sounds like you are doing well! I appreciate you taking the time to comment! I work as the bookkeeper inside a nail salon at a local mall. The shop itself makes 3,000 in debit/credit, and 5,000 cash daily. So, 30,000 a month sounds like a correct number for a small nail salon owner. Thanks for weighing in. It’s incredible that my student was so right-on with his info. That’s great Zena! Best of luck to you!! Yes, i agree nail salon do make huge money these days. I noticed that if you pay cash as a customer you will get discount on your services, and end if the year looks like IRS do not see that portion of income in report. My friend got her cash income as 150000 in 1 year after she opened her salon in Illinois. So indeed they will become millionaire within 6-8 years. Sometimes i wonder why i spend 8 years in college and still struggling to pay my bills. So if you want to decide between unclear career and nail salon i am pretty sure its worth to try. The average tech make $4000 month in cash. Wow–those are impressive stats. Thanks for confirming! That is great money for no college education. And with no college debt!!! The comments are spot on. I am a software developer. Recently I have just managed to get a higher salary position (6-figures). But after having talked to my best friend who owns a nail salon. I am tempted to open one for my wife. I asked my best friend what was his net income last year. He said $350,000. I told him, that doesn’t sound right. I asked him if he did his financial statement report, as in listing out all income and expenses, assets and liabilities. He said yes and explained each part to me and the numbers did add up. So he did not lie. I told him to keep it up, and don’t let his guard down. Success can be misleading and owning a business has ups and downs. So during the up times, he should prepare for the down times. Not every nail shop is successful. My mom owns a nail shop, and her income is much less than the average nail shop. But she still make a little more than a nail technician. Last but not least, I want to reveal another fact is that work/life balance can be terrible for the nail industry. The average nail technician work about 10 hours per day. A nail shop owner works more than that – probably average 11 hours. The average nail technician work 6 days a week while the owner work 7 days a week (that is if you are a serious owner, and not the lazy type). So that means you are spending about 60-77 hours a week working. You have to spend more time for other things such as cleaning up, organizing your shop, organizing your supplies, go shopping for supplies, maintaining the spa chairs and furniture, lots of laundry, and keeping up with the new trend and etc. Thanks so much for sharing this info. It’s really good to get verification on the numbers, but your point about being worked so hard rings true. My student’s mom didn’t even have time to eat during her 11-hour work days! I’m not sure why you are so surprised that your student not only knows how much money his family and extended community makes in the business that they own, but that he might actually have a well thought out plan for his own future. It’s incredibly condescending to believe that you must not only know better than him but that he must be completely confused. Unfortunately it’s an attitude that immigrants and people of color face daily. It often goes unchallenged because it’s a constant irrratation and it really only hurts the person who knows so very much they can’t learn anything else. While I don’t disagree with some of your thoughts, I do want to make a couple of things clear about this personal situation. One, I was this student’s teacher, and after having had a conversation with his mother at the nail salon where she worked, where she expressed in no certain terms that she did *not* want her son to work in a nail salon when he grew up, I felt I owed it to her to discuss the idea that college or trade school could be an option for him. Second, the entire point of the post was that my own deeply held convictions about college were being challenged (and continue to be challenged in the comments, which is why this is one of my favorite posts). Third, I am married to an immigrant and person of color and I, myself, was an immigrant for three years. 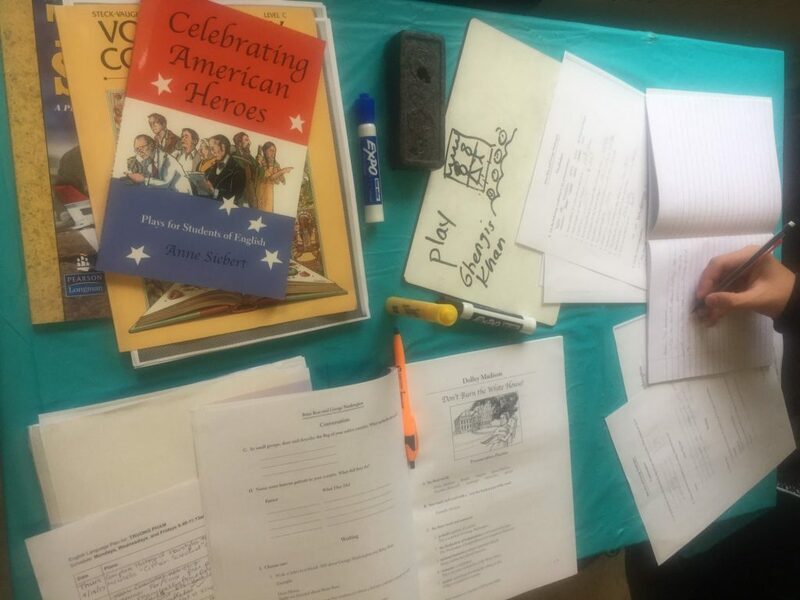 I believe that level-headed discussion and thoughtful discourse can help us all teach each other, which is one of the things I love best about my job as an ESL teacher. My husband, who is a college professor, and I have this conversation frequently: is college the only or even the best path? Certainly not! I think going to college has become something you just are suppose to do, but it isn’t the best path for everyone. And, really, unless you can ensure you won’t come out on the other end with debt or unless your heart’s desire is to be a teacher or a doctor or some other profession that requires a specific degree/educational path, then, really it may not make the most sense. Although, college does present a great opportunity to explore options (but, you can also do that other ways without paying for it) and to build a valuable network and people skills. Again, though, one can do the same in other ways. Overall, I don’t think going to college should be the default assumption without significant thought and evaluation. Personally, I have three degrees and, if given the chance at a do-over, I’m not sure I would have those three diplomas. Great thoughts, and I love the fact that even though your husband is a college professor, you’ve thought objectively about whether college makes sense. There is so much need for qualified tradespeople, and they get paid so much, that it blows my mind that more people don’t follow this path. There’s definitely a stigma in our society which is too bad. I also have many degrees, that are not really helping me get ahead financially. I’m a daughter of a nail shop owner. All my mothers are nail shop owners. Lol. I was also a high school teacher who was pro college. Right now, after having two kids, I’m looking to buy a nail salon bc my income as a teacher is barely enough to send my kids to daycare. Even my childhood buddy who is a pharmacist is looking to buy a nail shop. Now, thinking back, all the college educated kids in my generation are way behind financially than the kids who messed up that has no choice but to open a nail shop. Strange huh?